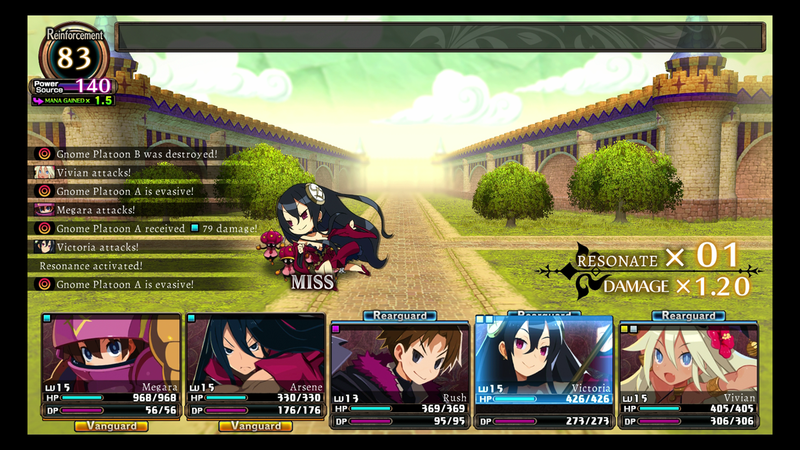 Labyrinth of Refrain: Coven of Dusk - Battle Features | NIS America, Inc. When your puppet soldiers attack an enemy with their basic attacks, they may inflict what is known as a “Gore Hit” and deal bonus damage. Sometimes, a Gore Hit will destroy an enemy’s vital body parts. 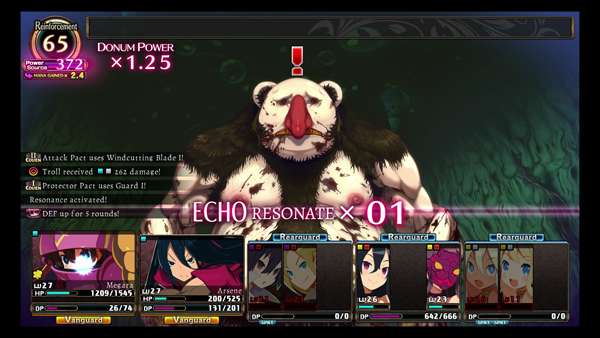 This is known as a “Critical Gore.” When a Critical Gore occurs, the enemy’s stats and maximum HP will be reduced. 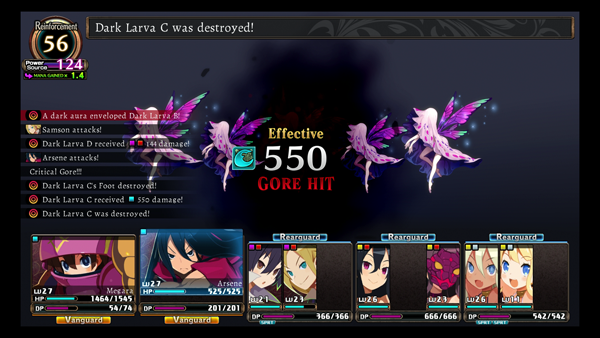 Be aware that your witch brigade can also lose their parts through Critical Gore. The effects of Critical Gore can be truly debilitating for your puppet soldiers, so you should repair your puppets’ missing parts as soon as you can, even if you must leave the labyrinth to do so. Attack Resonances have a chance to occur when your brigade performs consecutive physical attacks against an enemy. 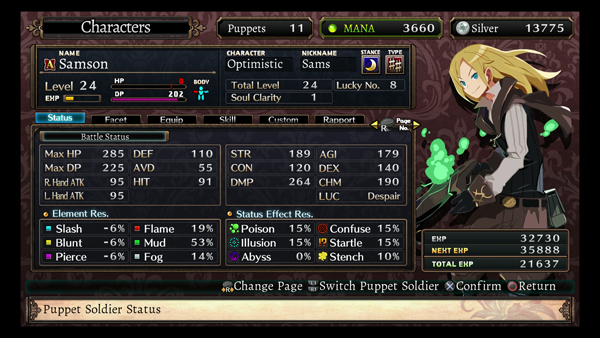 An Attack Resonance will increase the damage multiplier on all subsequent attacks that your puppet soldiers perform during that round of combat. 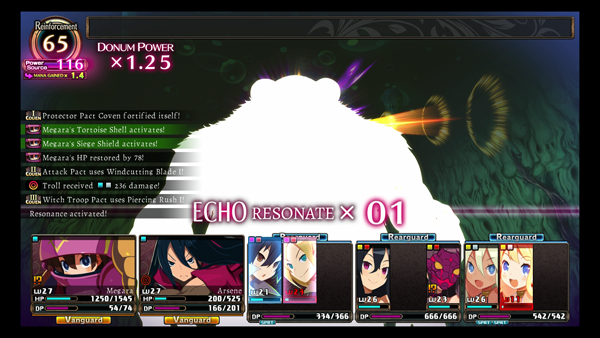 Attack Resonances can occur more than once during the round, increasing the damage multiplier each time! If the attacking puppets have compatible personalities and a good rapport with one another, they will be more likely to trigger Attack Resonances off each other. 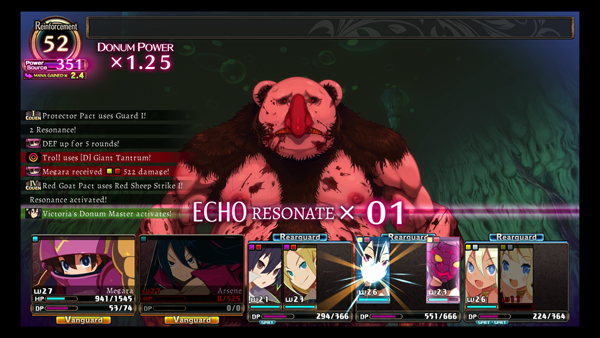 Also, each Attack Resonance will fill the power source meter, which further increases the likelihood of an Attack Resonance occurring. 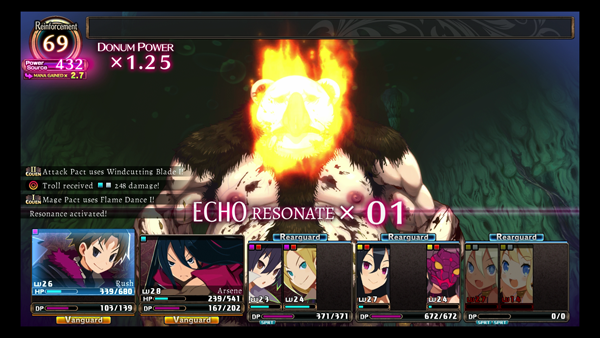 The power source meter represents the raw power that has accumulated during battle. Power source will accumulate as Attack Resonances and other actions are performed during battle, and using donum will consume some of the meter to increase their power. Any remaining power source is consumed to increase the amount of mana you receive after winning a battle. 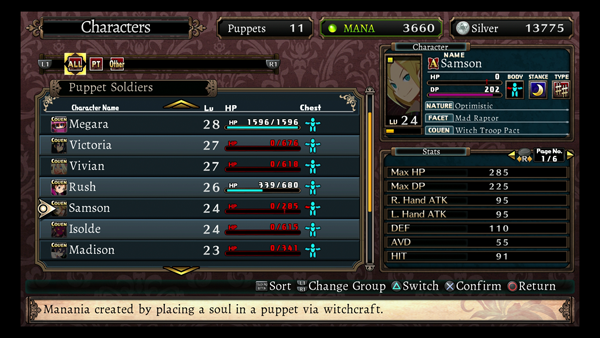 If you’re an RPG veteran, the simplest explanation for donum is that they are “spells” that your puppet soldiers can cast in Labyrinth of Refrain: Coven of Dusk. Donum Echoes are functionally similar to Attack Resonances; they have a chance of occurring each time an offensive donum is used in battle.. When a Donum Echo does occurs, a damage-dealing explosion will occur. This explosion will also restore some of the Donum Points used to cast the donum. Because any consecutive use of donum can cause a Donum Echo to occur, that means enemies can use donum after your puppet soldiers have used donum to trigger Echoes against your brigade! By mastering Gore Hits, Attack Resonances, the power source meter, and Donum Echoes, you’ll be able to make quick work of the dangerous monsters that roam the labyrinth! 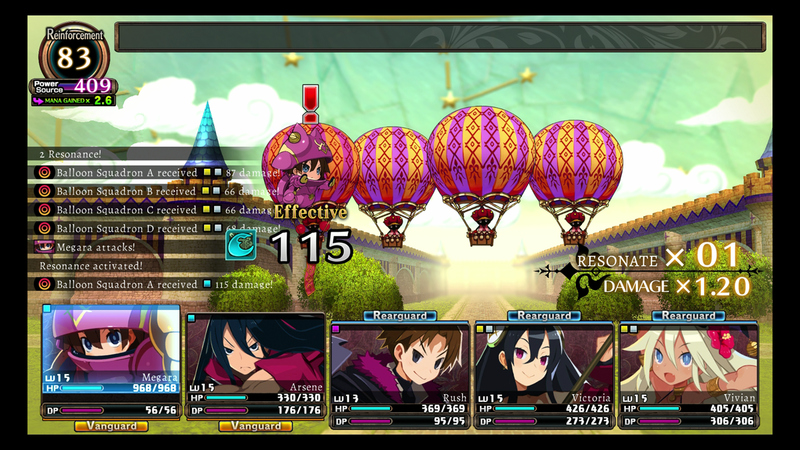 However, we have only scratched the surface of what’s possible in Labyrinth of Refrain: Coven of Dusk! Keep an eye out for more exciting updates about this title! 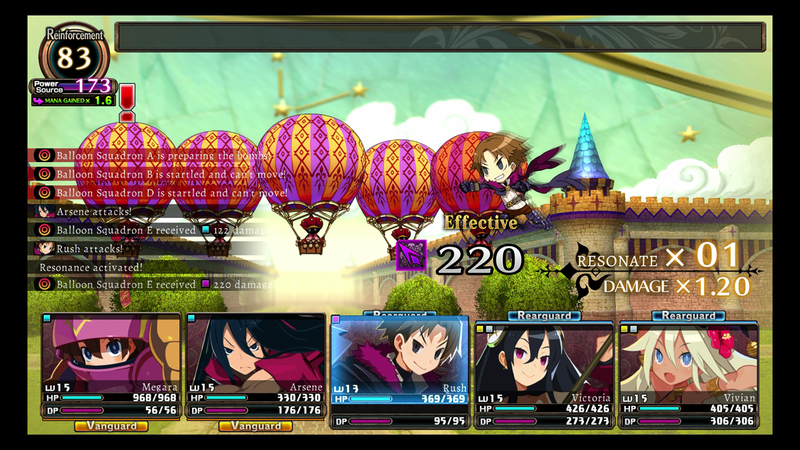 Check out our previous blog post to more about the Aster Knight and Shinobushi facets, or visit the main website to get a better glimpse of the world and gameplay of Labyrinth of Refrain: Coven of Dusk! 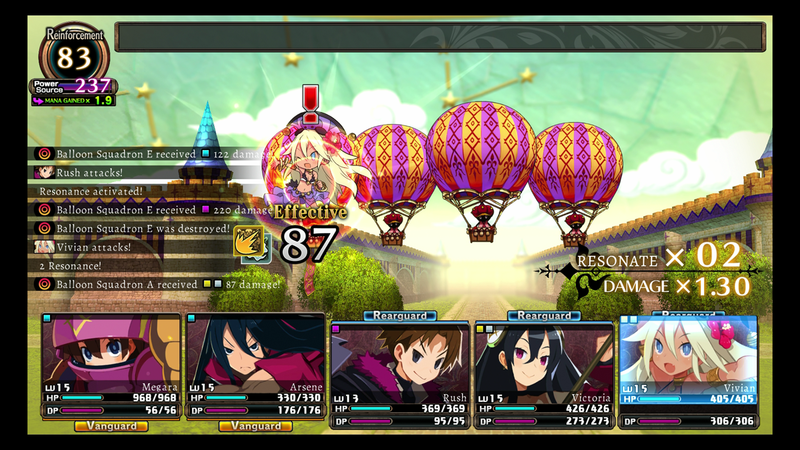 Make sure to preorder Labyrinth of Refrain: Coven of Dusk on PS4 and Nintendo Switch if you haven’t already, or add it to your Steam wishlist, so you can be among the first to experience this amazing title when it releases this Fall!